The market is on a roll, driven by earnings-related momentum. Still, geopolitical questions continue to overhang. Meanwhile, volatility is at multi-month lows, as measured by the VIX. That “fear index” receded below 16 early this week from above 30 as recently as late December. It feels like there’s a cautious optimism on Wall Street as VIX continues to ease (see more below). Earnings season has been better than expected, and a lot of CEOs on the earnings calls have made nice forward-looking statements. However, many investors don’t seem to fully trust this rally, with the tariff situation still hanging out there in the balance. That’s brought a bit of nervousness in, and it probably won’t go away unless there’s some sort of trade deal. Tonight’s State of the Union speech might bring more clarity on trade and other issues like the looming deadline for an immigration deal to avoid another government shutdown. Meanwhile, there’s more earnings news to absorb with Walt Disney Co (NYSE: DIS ), Ralph Lauren Corp (NYSE: RL ), and Archer Daniels Midland Co (NYSE: ADM ) reporting today (more below). European markets hit nine-week highs Tuesday amid solid earnings news. In another apparently bullish development, last night’s dinner between President Trump and Fed Chair Jerome Powell appeared to spark more optimism about a Fed rate “pause.” The Fed issued a statement after the dinner basically re-emphasizing that rate decisions would be data-driven. This echoes what Powell and other Fed officials have been saying for the past month. After Monday’s close, Alphabet Inc (NASDAQ: GOOG ) reported earnings and revenue that beat third-party consensus estimates, but shares lost a bit of ground in pre-market trading. GOOG’s financials ended the FAANG part of the earnings season, and those stocks had been outpacing the SPX so far this year going into the week (see more below). Though GOOG appeared to beat Street estimates for many of its key line items, pressure on the stock might have reflected investor concerns about the company’s costs and expenses, analysts said. Also, operating earnings fell a bit short of analyst projections. It might be worth considering, too, that shares had risen nearly 7% in just over two weeks leading up to earnings, meaning profit-taking on the news might have been another factor in the post-report selling. DIS is due to report after the close today, and analysts say it faces tough comparisons with a year ago. The thing investors might want to consider looking for is what DIS executives say about the future of Disney Plus, the company’s streaming service, coming on the back of Netflix, Inc. (NASDAQ: NFLX ) earnings. What are Disney’s plans for competing with NFLX? It’s a busy space, and a competitive one. Just yesterday, media reports said the FX Networks chief criticized how NFLX measures viewership. However, apparel maker Ralph Lauren saw shares surge 8% in the pre-market hours after the company beat analysts’ estimates. RL’s performance can sometimes help investors get a sense of how high-end shoppers are doing. As the week continues, economic data look a bit thin. However, there was some on Monday and it didn’t particularly impress. Factory orders fell 0.6% in November, when a consensus of analysts by Briefing.com had predicted a 0.3% rise. On the plus side, November durable goods orders rose 0.7% after falling a dramatic 4.3% in October. Still, Briefing.com expressed concern that factory orders for December might also have been weak considering the big market sell-off that month and worries then about a government shutdown (which ended up taking place and lasting well into January). It’s not too soon, maybe, to start thinking about possible impacts if there’s a second government shutdown. We have 10 days until the deadline, and President Trump makes his delayed State of the Union speech tonight. It wouldn’t be unheard of for the market to move based in part on a State of the Union, especially when you consider the possible ramifications on the economy if it looks like an immigration compromise might not be reached. Turning back to data, Monday saw the release of January’s Investor Movement Index® (IMXSM), which fell for a fourth-straight month to its lowest level since July 2012. The IMX—which measures what TD Ameritrade clients are actually doing and their exposure level to markets—appeared to reflect some ambiguity surrounding U.S.- China trade relations keeping investors in more defensive parts of the market. TD Ameritrade clients were once again net buyers during January. However, buying among equities was light, with clients gravitating toward less risky assets, including fixed-income products. This activity, along with decreasing relative volatility among widely held securities, including General Electric Company (NYSE: GE ) and Microsoft Corporation (NASDAQ: MSFT ), helped push the IMX score lower. Sixteen can be a meaningful number. For some, it might bring memories of birthday parties, or getting a driver’s license and barreling off in the family station wagon. There was also special meaning in 16 for the stock market Monday, as the most well-known “fear indicator,” the VIX, closed below that level for the first time since early November. A lower VIX, which in Monday’s case corresponded with both a S&P 500 (SPX) rally and the Fed’s recent more dovish stance, potentially might indicate less choppy action in the near future. It also could hint at investors maybe getting more willing to embrace cyclical sectors as fear retreats. While there’s no guarantee of this happening, the fall below 16 is a 180 from just over a month ago, when VIX rose above 36 during the Christmas Eve sell-off. That was the highest level since February of last year. VIX has fallen pretty steadily since Dec. 24, and is back near its historic average in the 15 handle. Often, but not always, a lower VIX can mean a less risk-averse investor mood. A market like December’s—when major indices seemed to go up or down (more often down) 2% every session—can have some investors looking for “risk-off” places to put their money. While there’s no “risk-free” investment, a high VIX means investors often tend to gravitate toward some of the bond-like sectors such as utilities, or simply pull money out of stocks and put it in fixed income or gold. Utilities and health care were among the leading sectors in December when VIX was soaring. Gold also rose sharply. Contrast that with Monday, when info tech easily topped the leaderboard with a 1.6% gain. Accompanying that were solid performances in other so-called “risk-on” sectors like industrials and communication services. Defense sector stocks and some of the “FAANGs,” including Netflix, performed particularly well. At the same time, health care and utilities were down near the bottom of the performance ladder. 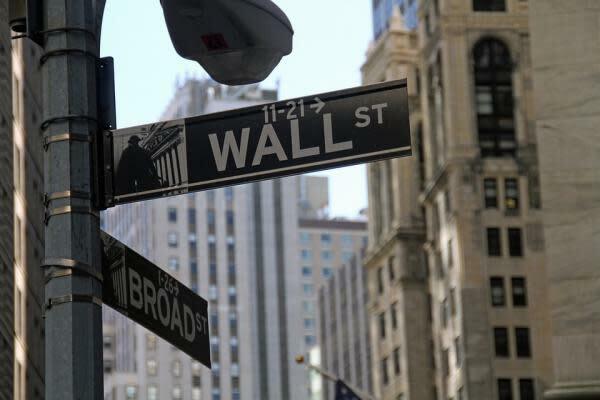 Some of the stocks that climbed Monday included ones that were beaten up the most last year amid higher fear levels, including Apple Inc. (NASDAQ: AAPL ), Boeing Co (NYSE: BA ), and Facebook, Inc. (NASDAQ: FB ). Lockheed Martin Corporation (NYSE: LMT ) and Microsoft were also among the big gainers. People sometimes underrate how psychologically what AAPL means to the market. When its shares fell to 52-week lows, that appeared to cause some investors to decide it was time to come back into the market—and not just into AAPL. Some other beaten-down stocks that also exert influence (though maybe not to the same extent as AAPL) include General Electric and Ford Motor Company (NYSE: F ). Figure 1: WHAT A DIFFERENCE A MONTH MAKES: The CBOE Volatility Index (VIX) finished 2018 with a 25-handle, down a bit from the Christmas Eve stock market selloff, but quite a bit higher than where it finished Monday at 15.7. The term structure of the fear index has been altered as well. 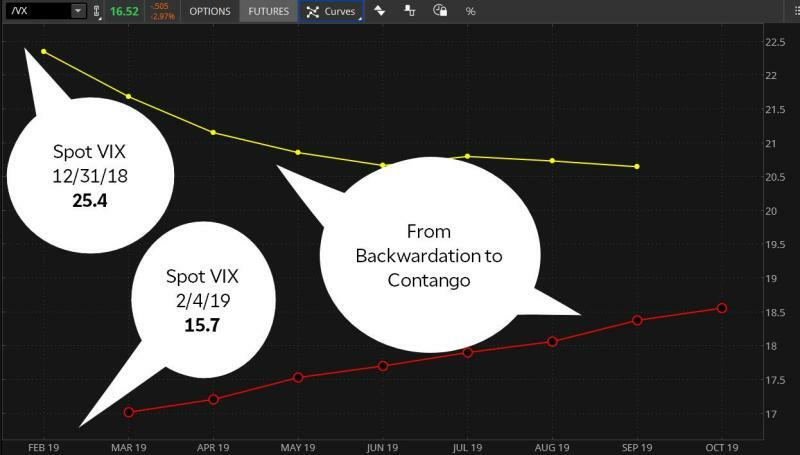 Note the shift in the futures (/VX) curve from the beginning of the year (yellow line) to Monday (red line) has gone from steep backwardation (near-term futures higher than deferred months) to contango, with lower prices in the near-term futures contracts. Data Source: CBOE Chart source: The thinkorswim® platform from TD Ameritrade. For illustrative purposes only. Past performance does not guarantee future results. Revisiting FAANGs: Anyone who wrote off the FAANGs after last year’s swoon might be having second thoughts now as the five names (combined) are slightly outpacing the S&P 500 (SPX) year-to-date. FAANG names combined were up more than 9% in 2019 as the week began despite what might be best described as a mixed earnings season for the closely watched stocks. While investors seemed to greet Facebook and Apple earnings with elation, they didn’t appear so wild about what they heard from Amazon.com, Inc. (NASDAQ: AMZN ), GOOG, or Netflix, at least judging from how the stocks performed after company financial data hit the news. What remains to be seen is whether the FAANGs can start to recover some of the excitement that helped make them momentum drivers of the 2016-2018 market rally. The FAANG stock recovery early this year occurs as the overall market also appears to be in recovery mode, but what’s not so clear is whether FAANGs are simply rising as part of a tide that lifts all boats or if they’re in the vanguard. Considering the various issues that now divide the FAANGs—privacy, user growth, China trade, advertising demand—it could be difficult to see them trading once again as a solid block leading the market higher (or lower). Cool Beans? : Amid the wrangling over trade tensions with China, soybeans might be a key ingredient. Though China recently re-entered the U.S. soy market, agreeing to buy 5 million tons of the oilseed, it's still a drop in the bushel compared to its purchases in prior years. And according to Jim Collins, head of DowDupont Inc 's (NYSE: DWDP ) agricultural division, farmers might still be unconvinced in the soybean's return to export prominence. Though many farmers are holding off in making final planting decisions, early signs still point to a downshift in soy plantings in favor of corn, and to perhaps a lesser degree wheat and cotton, Collins says. Agribusiness firms such as DWDP typically get a first-hand view as sales of fertilizer and seed, purchased at the start of the growing season, might offer clues into planting preferences. Tech Talk : Looking for a moment at the technical underbelly of the market, the S&P 500 Index (SPX) has left the 50-day moving average far behind and for the first time in a while has the 200-day moving average back in sight. Last month, the index bounded past the 50-day average (now near 2609) and then faltered and tested it. That support appeared to hold, and the SPX is now above 2700 for the first time since early December. The 200-day moving average is a moving target, of course, and is down from where it stood back a month or two ago. As of Monday, it rested at 2741, just 17 points from where the SPX closed. While the 200-day moving average seemed to represent solid support for much of last year before the autumn sell-off, according to many Wall Street analysts, it could now form a resistance point. Sometimes—but not always—market momentum can pick up when a major index takes out some of the moving averages. The 100-day moving average of 2709 is another one investors might want to consider monitoring. Even if you don’t trade the technicals, getting familiar with these levels can sometimes help an investor better decipher the market’s behavior.